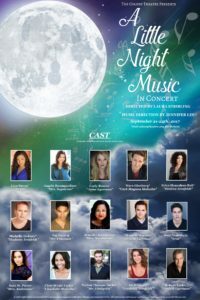 A new group of musical theatre artists whose mission is to bring quality Musical Theatre to Burbank, focus on diversity in casting and encourage women to step into leadership roles off the stage made an auspicious debut on September 21 at The Colony Theatre in Burbank with their concert presentation of A Little Night Music. They did not choose easy material to begin their mission. Hugh Wheeler’s book is filled with witty and acerbic dialogue overflowing with sexual innuendo and marital conflict and is at heart a romantic comedy, based on the lightest film in the Ingmar Bergman catalog. Stephen Sondheim’s music is always a challenge for performers and in this luscious score he has set every song in waltz mode. Musical director Jennifer Lin on piano, aided by an un-credited cellist, made beautiful sounds. Laura Stribling economically directed the staged concert moving her performers, with scripts in hand, around the bare stage, using a few well-placed chairs as various set pieces. 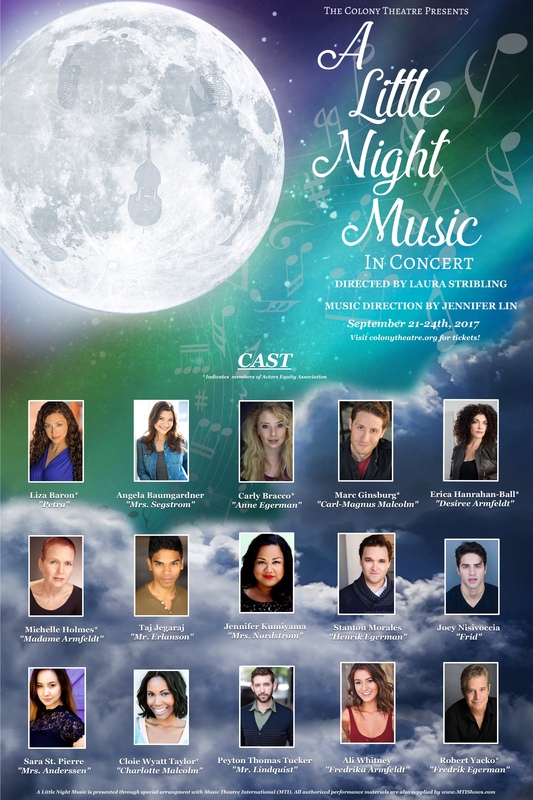 Most of the cast were up to the demands of filling the large yet intimate space with their voices and performances. Erica Hanrahan-Ball gave constantly touring actress and mistress Desiree a vibrant sensuality that quickly conveyed her soiled past and her hopeful future. It was easy to see why men would be willing to fight duels over this woman’s carnal attractions. (Her rendition of “Send in the Clowns” received the longest ovation from the opening night crowd.) Her former lover Frederick (a somber Robert Yacko) hopes to rekindle their past passions to assuage the sexual void in his 11 month marriage to the 18 year old virgin Anne (a perky Carly Bracco who possesses a lovely soprano). Desiree’s current lover Count Malcolm (a very militaristic and forceful Marc Ginsburg) can’t accept his mistress’s infidelity and schemes with his bitter and vengeful wife (Cloie Wyatt Taylor) for revenge on Frederick. Add in Frederick’s virginal ministry student son (Stanton Morales) and the lusty maid Petra (Liza Baron) and the complications multiply. They all come to a head during “A Weekend in the Country” at the chateau of Desiree’s dowager mother (Michelle Holmes), a former courtesan who has been instructing her illegitimate granddaughter (Ali Whitney) in the ways of the world. The production’s major failing is the sound in the theatre. A multitude of floor and hanging microphones did a good job of catching the performers notes and dialogue but Holmes and Taylor most especially need to project more. They have most of Wheeler’s pithiest dialogue and most of the audience was straining to hear it. Hopefully the problem can be solved when this new group takes on its next project.